A spectacular 60 km trek that will lead you to the enigmatic last refuge of the Incas. 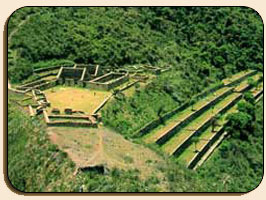 Choquequirao (3.103m) is a huge archaeological complex still under cleaning and restoration process located in the surroundings of the Salkantay sacred mountain (6.271m) and the Apurimac river canyon. You will enjoy amazing mountain scenery as well as lots of Andean flora and fauna.